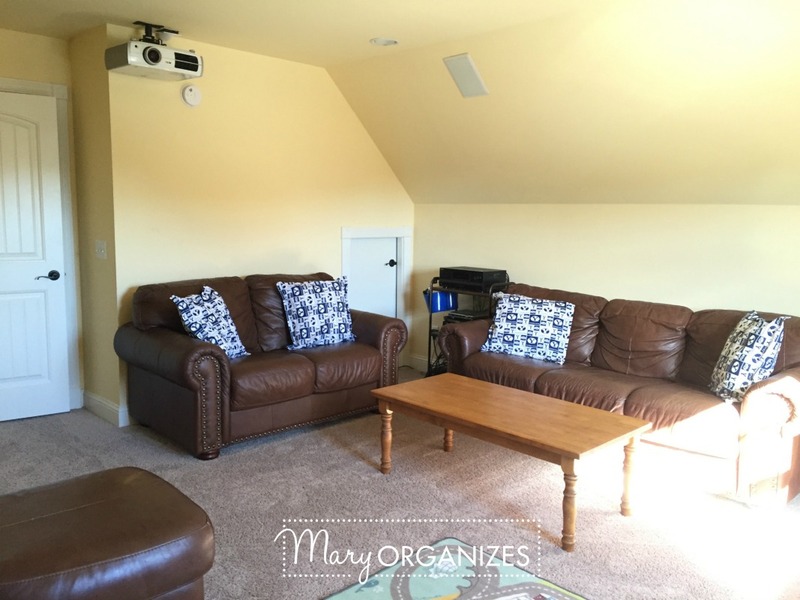 Our playroom doubles as our family room, and sometimes even a little home movie theatre. As our kids grow older, I expect to change the look and feel of this room quite a bit. It definitely fits us now, though, and that is what matters. Sometimes I get an urge to gut it and do an extreme makeover with new furniture and all, but then I remind myself how convenient using our 12 year old leather couches is when our kids are climbing around in here and I don’t have to worry about them harming “precious new furniture”. Our youngest is three, so in a few more years I think I’ll start updating the look of the room. Platform Stage built by my husband and my dad: My girls love putting on Shows for us! It is not actually attached to the floor or wall, but it is extremely heavy and isn’t going anywhere. It is covered in carpet so it doesn’t have any sharp corners. Track lighting on the ceiling: I had plans for the stage from the beginning, so I had track lighting installed so it could be a spotlight when the girls put on their shows. There are recess lights in the room for regular play-time. Pull-down Project Screen: That large horizontal bar above the window is a projector screen that pulls down when it is time to watch movies. The window has a rolling blackout shade instead of window blinds. I love how this allows us to make this room so multi-purpose. The projector is up on the opposite wall. Pop-up castle: I love this inexpensive toy from IKEA because as soon as my son outgrows playing with it, it will be very easy to remove. Car-Truck Carpet: A carpet with streets and buildings where my son drives his cars around. Toy shelf and dress up hooks on the right: I’ll show that in greater detail below. Over here we have the toys. Some of these bins, especially the ones with big balls, are very full. But some of the bins are less than a quarter full. I group the bins by what makes sense, not necessarily trying to make all the groupings the same amount of toys. I prefer non-labeled bins for kids toys. 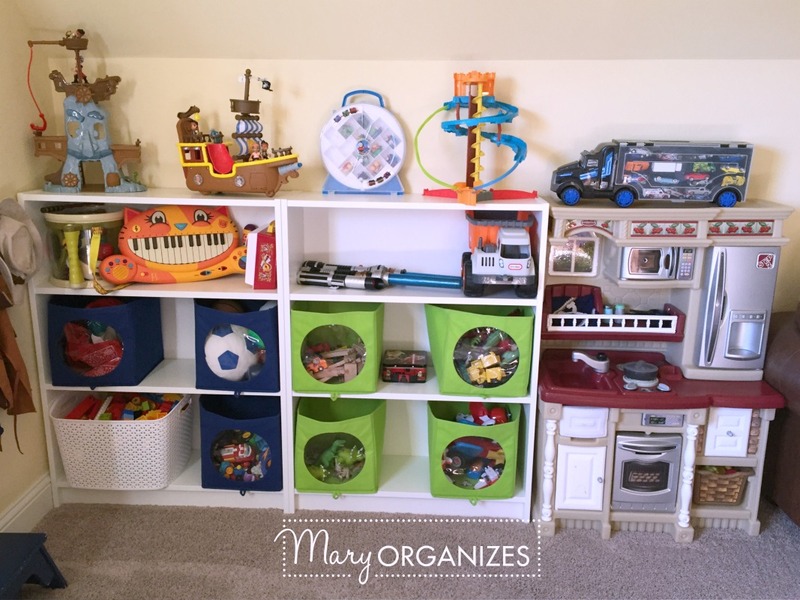 I feel like I may need to repeat that, because it may sound really unusual coming from a professional organizer – I prefer non-labeled bins for kids toys. Bins the child can see into like clear or shallow bins are better than labeled bins for a few reasons. First of all, kids toys are always changing at every holiday and birthday. It would take a very proactive parent to keep up with the labels. I want to set people up for success and self-maintaining systems are more successful. Changing out kids toys when they are getting rid of something and getting something new needs to be as easy as switching out the contents of a container!! I have a step stool in the playroom for a few reasons. First of all, my son is going to climb up to get the higher toys one way or the other, I might as well make it a safer way! That reason is good enough, but the step stool also allows him to easily hang up his dress-ups when he is done. This piano used to be in my husband’s office until last year when he started working from home. My girls practicing after school didn’t mesh with his afternoon conference calls, so we relocated the piano up here. Now I love it up here! One reason is because they end up playing it so often while they are just hanging out in the family room. It is kind of an awkward-looking fit, but it is really working out for us. 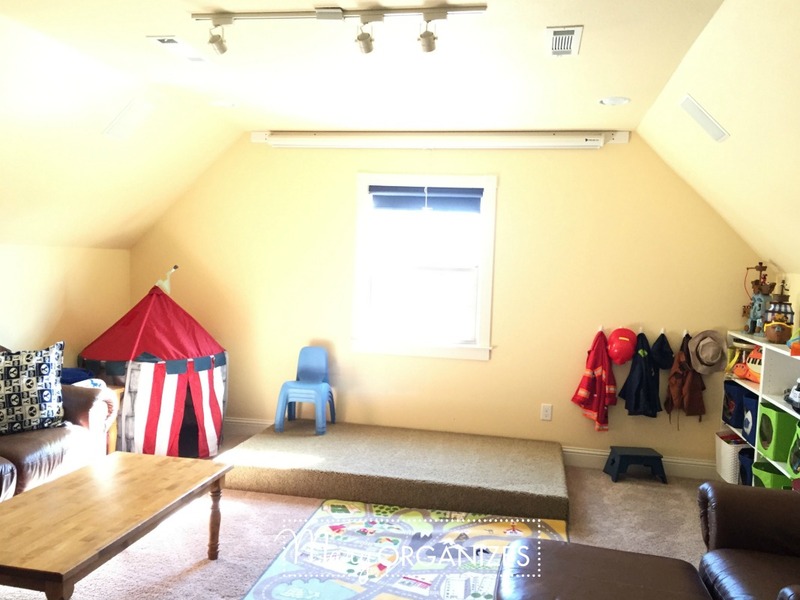 So there is our Playroom, our Family Room, our Movie Theatre … though around here we just call it “the Playroom”. Do you have a room that takes on multiple names or purposes like this? I was really curious to have a look at it and see how the toys are organized. We don’t have a playroom or a family room unfortunately, so the toys have to be organized neatly in the living room and the kids rooms. I tried to keep it simple and it works quite well. I adapted your “Super Tidy” and the “What’s not basket”, it makes a huge difference now. Oh yes, the Super Tidy and the What Not Basket are Sanity-Savers for sure!!! I feel the same as Dana, I have been wanting to have a look at your playroom and toy organization. I love the command hooks for the play outfits. I may steal that and the bookshelves with the cube storage containers in them. I have the exact same book shelves and several storage cubes around. The hardest part is going to be the massive toy purge. We have way too many. Thanks for sharing. Now I know what a realistic amount of toys is. I haven’t decided if it inspires me more to see a room like yours or one like my friends that is so crammed that her kids can’t find anything. It is so interesting, because this still feels like a lot! I feel like this is the age (3-7) where there is the most toy stuff. (As they get older, it becomes books, electronics, hobby-stuff.) If we can get through it with less stuff, we are setting a precedent for a simpler future of stuff! Great idea ! Nice area for the kids to play & family to hang out together. I plan to convert my son’s playroom into a multi use chill out area since he’s a teen. Planning to utilizing the closet by adding shelving to store games, photo albums, & some of his toys (hot wheels, legos, & keepsake books) from when he was younger. Thanks for sharing! Great idea! I think you’ll love the new use of the space, and so will your son! Very all purpose room and it looks to work. Love the ‘center stage’, use of having the projector screen on window wall and the overhead lights. Looks to be a great room to just hang out as a family or again the kids playing with each other. Sweet! Thank you! We really do love it in there! I need a serious toy purge, but do not know how to go about it. Do I involve the kids or not? Do you have any stashed for rotating? Any past or future posts? Love your site. Thanks for all your hard work. It is making a difference. Are the toys just a general mess of toys or do they “belong” to certain people. If they are in a common area, I think you could probably just go through them. 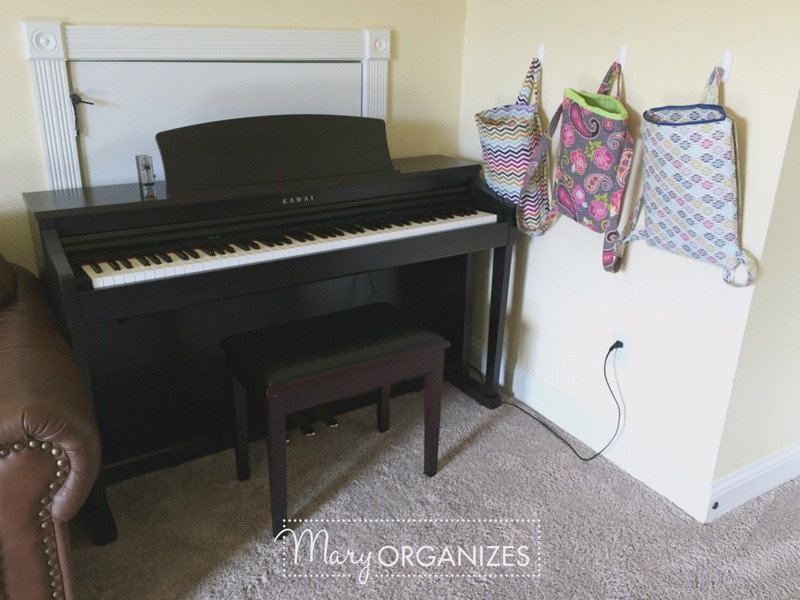 Before you do, read my post from a few weeks ago about Guiding Kids to Declutter just to make sure you check your bases. Best of luck! I know, I’m such a rebel organizer! lol! And thank you! 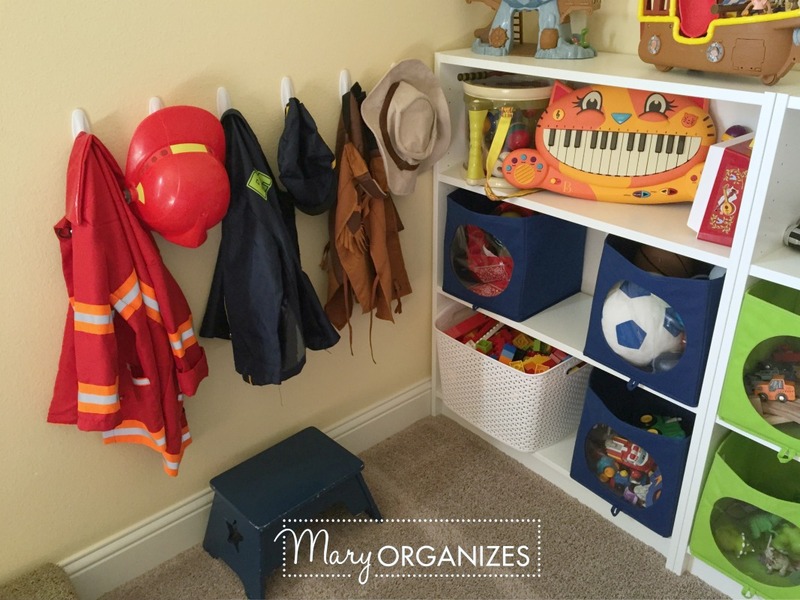 You mentioned that each kid is assigned a room for cleaning. I would love to see a post of yours describing your kids chores and how you assign them. I am working on trying to get a set chore system for everyone because I truly need some help with the chores! I also noticed your chore charts in one of your previous posts. Maybe you did a kid chore post before? If not, I would love to know what your system is. Thanks for all of your helpful info! Hi Mary! 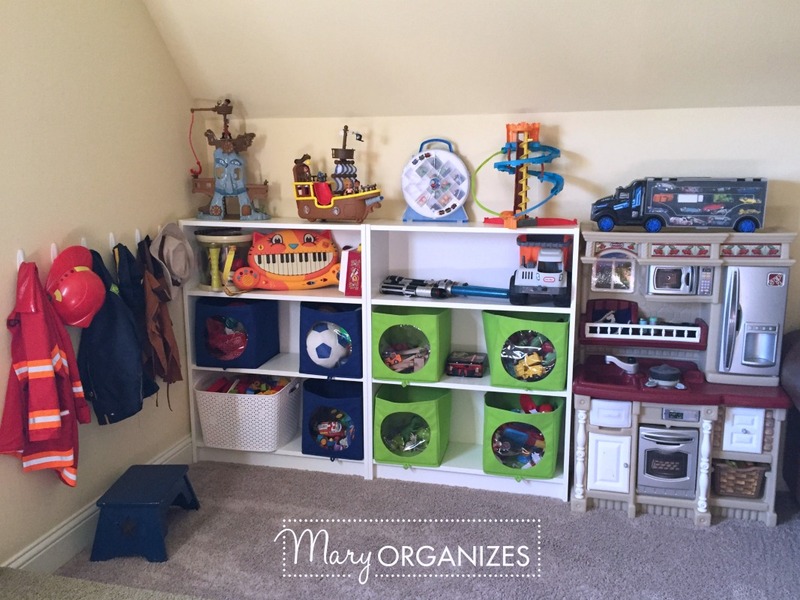 Love your playroom organization! May I ask where you found the fabric toy bins with the clear circles so the kids can see what is inside? They are fabulous!